Red Dead Revolver managed the impossible: it made me glad whenever the load times ran long. It's not that I was dreading the thought of actually playing the precursor to Red Dead Redemption; on the contrary, it boasts enjoyable third-person gunplay in a stylish Spaghetti Western setting. But every extra second my PS2 took to load the next level off the disc was another chance to savor the fantastic loadscreen animations. Any loading screen that eases the pain of waiting should be commended, but RDR turns its hardware-imposed preambles into positively hypnotic demonstrations of skill and personality. There's no gimmick like interactivity at play here - just pure, highly engaging artistry. You play as a host of characters over the course of RDR's sizable campaign, and each one gets their own personalized loadscreen. The basic framework is always the same: various supersaturated shots of the character doing something interesting, silhouetted in front of a giant sun that stutters as it sets because it's a stand-in for the standard, boring loading bar. You can watch all the loadscreens with this handy playlist, but the one you're going to see most often is below: our hero, Red Harlow, deftly spinning his six-shooter in front of a blood-red horizon. The only sounds you can hear are the softly clinking metal of the pistol as it whips around Red's trigger finger, and faint gusts of desert wind rolling through. It's like an artsy, minimalist Western poster come to life. 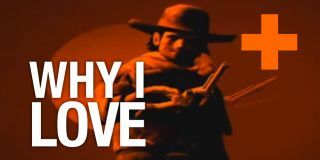 This simple, looping animation is surprisingly mesmerizing - and when the game's all loaded up and ready to roll, Red holsters his gun with a satisfying slide. Fans of Revolver Ocelot's legendary gun spinning in Metal Gear Solid 3 should appreciate Jack Swift's loadscreen, where the English sharpshooter whirls his twin revolvers around as if they were hand-mounted propellor blades before ending his impressive performance with a showman's bow. Annie Stoakes shows off her skills with a one-armed reload of her Winchester rifle, ending her weapon inspection by turning and dry firing at the camera. These little vignettes serve as calm exhibitions of expertise; a serene respite between all the bloody shootouts and their staggeringly high body counts. Even the minor playable characters - who you might only control for a single stage - shine in their special intros. The rigid movements of the Buffalo Soldier's drills perfectly convey the way his militaristic training contrasts with the Wild West, and before you step into the shoes of the villainous General Diego, you watch him closely inspect his shotgun before spinning around as if he was expecting to be backstabbed. Rockstar San Diego even plays an ingenious trick on your expectations, as seen in Shadow Wolf's loadscreen. The Native American warrior stands stoically still, to the point that you might think the game glitched out and didn't trigger his animation - but that's exactly when he throws a knife towards the screen at lightning speed. I can't overstate how much I prefer these loadscreens compared to the standard fare, be they a blank black void with a little animated icon or a giant piece of concept art plus a few words of advice. Games so rarely give us the chance to spend time with their characters during their quieter moments - the lulls between all the action, where our protagonists get a chance to just breathe and practice their craft before the next battle. By using those moments to mask an unavoidable constraint of disc-based games, Red Dead Revolver turns its every loadscreen into an endearing display that I'm always eager to behold. Why I Love encapsulated all the little details of gaming life that sometimes get ignored. This is the last in the series, but you can check out every Why I Love here. Thanks for reading! Follow @gamesradar on Twitter for updates.